Representatives of the Gilets Jaunes will meet Prime Minister Edouard Philippe this week, ahead of a second protest on Paris's Champs-Elysées, it has been announced. After Mr Philippe and Ecology Minister François de Rugy will meet an official delegation on Friday (November 30) at 2pm - with the grassroots movement hoping "this meeting will be more satisfactory and concrete than the first", with Mr Rugy on Tuesday. In a statement, the Gilets Jaunes representatives said the meeting would make up "part of the consultations that the Prime Minister chairs to define the organisation of the citizens' consultation that will take place throughout the country". A group of eight people was appointed on Monday to "establish a serious and necessary contact" with the government and transmit a series of demands. The movement enjoys huge popular support. 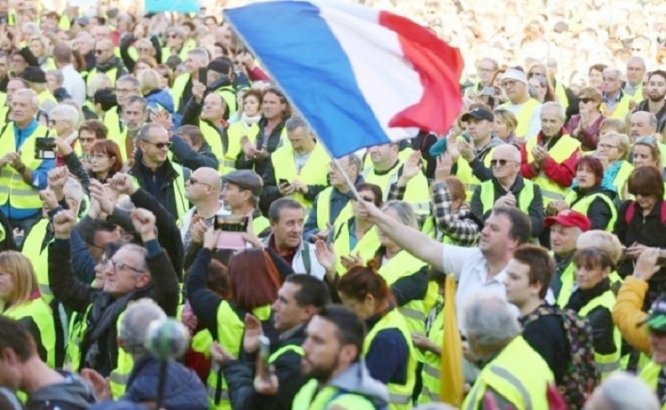 A survey for BFMTV on Wednesday (November 28) revealed that the Gilets Jaunes had the backing of 75% of the population, made up of 46% who gave their total support and 29% saying they were sympathetic to the movement. One of the appointed delegates, however, has refused to attend. Eric Drouet, who met Mr Rugy on Tuesday has rejected the invitation to Matignon. On his Facebook page - La france énervée - he revealed he would also withdraw from the official Gilets Jaunes delegation, which he said he no longer considered representative of the movement. The meeting will be held a day before a second planned protest on the Champs-Elysées in the capital, a week after a demonstration on the famous thoroughfare descended into violence. Jean-Luc Mélenchon, leader of the far-left France Insoumise party, which is currently troubled by a wave of departures and internal struggles, has said that he will join the protesters.